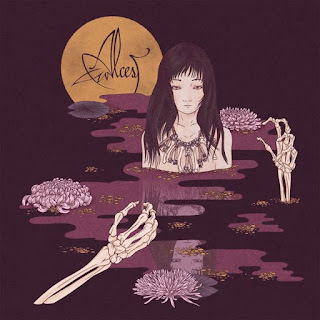 After the release of Alcest's Ecailles de Lune in 2010 (crown jewel of their discography according to many), Alcest cemented themselves as a band whose new material I would wait for with bated breath. Acting as progenitors for the musical hybrid of shoegaze and black metal, they put forth sounds that were so pristine in their serenity, it could be considered a spiritual endeavor to consume their material. But, as with many bands that pioneer a certain sound, sometimes they try to venture too far outside of what made them appealing in the first place (just ask any Opeth fan). For Alcest, this step outside the norm was with their last album from three years ago, Shelter. On this effort, they dropped any and all elements that would be considered "heavy" and fully embraced the ethereal aspects to their sound that made Shelter come across as a dream-pop album; one that was decent at its best points and tedious for all the rest of its duration. However, moving forward with their latest release, Kodama, Alcest showcases a welcome return to form, albeit a seemingly short one. As soon as I caught wind that this album would revisit the Alcest sound of yore, I was immediately excited by the prospect of some harrowing yet satisfying Neige screams. Surely this is also the knee-jerk reaction of any other pre-Shelter Alcest fan out there. The album's opening (and title) track, features, count them, nil shrieks. Rest assured, though, that this track succeeds in every other area possible. Featuring vocals from Katerine Sheperd of Sylvaine, the album begins with a flourish of well constructed melodic hooks that flow off of each other effortlessly. While the guitar work transitions back and forth between the band's strong black metal underpinnings and the sublime nature of their more ethereal side, the bigger point is that these transitions are fluid. The compositions are constantly dynamic and never falter to keep your interest. Neige's other-worldly vocals are also as entrancing as ever. The meat of the rest of the album harnesses the strengths of the first track, but throws in faster-paced rhythms and, wait for it......yes, Neige's screams back into the mix. "Je Suis D'Ailleurs" ("I Am From Elsewhere" for the French impaired) is the first track to really take this formula to new heights; mixing these elements in ways that create huge emotional build-ups and triumphant walls of sound. Even in the album's more melodic moments, there's always something present that delivers that assertive "punch". While Ecailles de Lune had a much denser permeation of placidity, Kodama shares a similar album flow. The opening tracks bring you in with melody, the middle hits you hard(er), and the end trails off in a more hypnotizing manner than the album's beginning. The only real complaint I've can manage to muster about Kodama is that the whole experience felt way too short. The album is six tracks long, but much to my surprise its runtime totals 43 minutes, which is around the norm for a full-length release. Perhaps it's a testament to the album's ability to captivate that made the time seem to fly by, but it certainly could have used one more track at minimum. "Onyx", the album's instrumental closing track clocks in just under four minutes, but easily could've been extrapolated into a much more fleshed out coda. Despite my gripe about the album's length, make no mistake; Kodama's strong song compositions and cohesion is undeniable. By bringing back the heavier aspects to their sound, Alcest managed to put forward the most thorough representation of their music to date. I have yet to do so, but I would love to talk to a fan who is strongly pro-Shelter. For me, Alcest as a band is best represented by a yin and yang - the melodic singing and shoegaze-y distortion cannot exist without the tremolo picked guitars, fast drum beats, and wailing screams. Kodama drives that point home, and is an album that would be foolish to miss out on.